The US covers almost 3.8 million square miles. In fact, it is 3,794,101 square miles with 6.76% of that being water. I got my numbers from Wikipedia because the US CIA Factbook has for some reason, opted to list all measurements in metric. This could become an entirely different rant, but I already have a title, so I will try to stay on topic. And I will have to convert from metric, a system we don’t use here, to the system we do use, archaic as it might be. I need to do that because kilometers, whether linear or squared, mean nothing to me. The CIA helpfully lists, how many kilometers of borders we share with other countries. With Canada, we have 8,893 km of abutting lands, lots of that along the Alaskan border. For those of you who can’t compute that data, it is 5,524 miles with 1,538 miles shared with Alaska. The other country where we share a land border is Mexico. That border is 1,951 miles, according to my calculations. Alaska is joined by Washington, Idaho, Montana, North Dakota, Minnesota, New York, Vermont, New Hampshire, and Maine as sharing land borders with Canada. Wisconsin, Michigan, Ohio, and Pennsylvania also share borders via the Great Lakes. 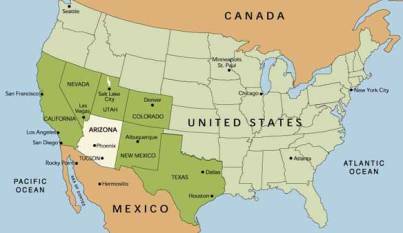 California, Arizona, New Mexico, and Texas share a land border with Mexico. Texas and Mexico are next door neighbors for about 790 miles. The Arizona-Mexico border is about 390 miles long. The other two states have less contact. There are currently 42 US-Mexico border crossings, places where one can legally move from one sovereign region to another. People living in say, Kansas, Missouri, Nebraska, or Iowa are quite distant from any border. They are sequestered in the middle of the country. The only place more difficult to get to is Hawaii because there is so much Pacific Ocean around the state. America, like every other country (including Mexico) has immigration laws. There is a process one goes through in order to come here. One can visit with a passport. If you are planning on staying, there is a bunch more stuff you simply have to do. To be legal, that is. When you don’t take the proper steps, you are not legally here, either as a visitor or resident. The southern Mexican border is rigorously guarded against illegal immigrants moving north. The northern border – well, not so much. Being here illegally is, to put it baldly – illegal. Hence, the name. We have an estimated 11 million illegal aliens running loose around the country. Some may end up in Kansas or Iowa, but the border states see a lot more of these illegals. There are only around 310 million people here legally. Arizona is concerned about a rising crisis in illegal immigrants. The federal government is less concerned since Washington, D.C. is not really close to a border. Very few people can swim the Atlantic Ocean to get here. But Arizona wants something done. They plan to deport illegal immigrants. This is seen as a problem by many people who are not near an international border. They decry this as racial profiling. I would like to ask those concerned citizens tucked safely away in central United States of America, what are you talking about. I believe the Arizona law would deport anyone unable to display proper and legal papers. There is no one “type” of person other than illegal alien. Again, I would ask why anyone would think they were targeting Mexicans specifically. Ah. I see. The reason it would be racial profiling Hispanics is because Mexicans are the people they are most likely looking for. If you ever listen to a police scanner and they issue an APB on someone, they usually give as much identifying information as possible about the suspect. They don’t leave out that the person is one gender or the other. They include physical features and often include the outfit the person is wearing. This allows a better likelihood of catching the person one is looking for. We are so busy bending over backwards about looking for something, we want to pretend that what we are looking for is not predominantly one thing or another. The illegal immigrants flooding the southern border are Mexicans. They might be from other Central American countries, but Mexico does a tremendous job of keeping those from more southern locations from getting this far north. So, I guess in order to look for illegal aliens, we should target … who? Or are we just supposed to forget that we have borders at all.